Each November, some of the brightest minds in the automotive world set up tent in the far north of Europe to push the envelope of modern vehicle design during the grueling winter season. At a first glance, Arjeplog, a small town in the north of Sweden just shy of the Arctic Circle, may not be the ideal candidate for a winter destination. While there is plenty of snow and ice, there is hardly any skiing; and with less than 3,000 people spread over almost 15,000km2, the nightlife is negligible too. But if you plan on testing classified technology in peaceful seclusion, away from a curious crowd, it may be just the right place to settle. And, that's exactly what Europe's automotive elite did. Since a first 'reconnaissance party' arrived here in the 1970s - searching for a quiet and sedate place to put technology to the test that wasn't even officially invented yet - Arjeplog has become the mecca of European automotive testing. Many a prototype has since been spotted on the snowy Silvervägen, Arjeplog's main arterial road, and the town developed a whole industry catering to the annual incursion from the south. One of the first businesses to settle in Arjeplog, following the likes of Bosch and Daimler, was German braking specialist Knorr-Bremse. According to Dr Eduard Gerum, the company's retired head of engineering and one of the men who pioneered vehicle testing in the Subarctic, there was hardly any infrastructure in place when his team first arrived, but the proximity to a silver mine meant there was suitable equipment and staff available to create a makeshift test center. "We started with hardly anything but have since built a highly sophisticated, companyowned test lab up here. It's amazing to see how far we've come in such a short amount of time, and I am sure many of the technologies we now take for granted in the heavy vehicle sphere, like ABS, would not be as efficient as they are if it wasn't for Arjeplog," he says. According to Dr Gerum, who is still visiting frequently as a consultant, the harsh climate is perfect to see just how much a new innovation can take, and the remoteness can provide at least some of the solitude needed to work on equipment that has not been officially released yet. 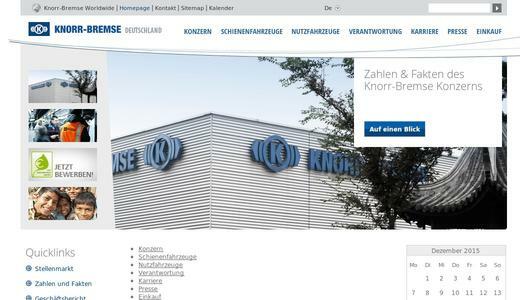 From a simple corrugated iron shed in the 1970s, the Knorr-Bremse test center has grown into a high-tech facility with an integrated heavy vehicle workshop, offices with high-speed Internet connection and, most importantly, a company-owned test track. As an internationally acclaimed OES, it is here where the company does much of the finetuning for new truck and trailer braking technology before it goes into serial production. "From ABS to more complex technology like EBS and ESP/RSP, we lay much of the development groundwork during those three or four months we spend up here," says Dr Gerum, struggling to hide his excitement about the opportunities Knorr-Bremse's northernmost outpost has opened up for the brand. "Most of the work we do here is adjusting our equipment to a new truck and trailer model that is about to be released, so we do a lot of driving here to cover all our bases." The Knorr-Bremse test facility comprises of a land test track just next to the actual workshop, as well as a second area on a frozen lake down the road. At the heart of the land test track is a long straight, one half of which is heated concrete and one polished ice. "It's here where we separate the wheat from the chaff," says Dr Gerum. "The truck comes down a small hill and has to come to a complete standstill with one side on the ice and the other on concrete. It's the biggest possible deviation in friction there can be and a real challenge for the braking system to keep the vehicle stable." The same scenario - commonly referred to as μ-split - has been recaptured on an adjacent hill to simulate the most complex hill start possible, with one side of the vehicle left with virtually no grip. "Nowhere else can you recreate these conditions in such a low risk environment," he says. "The worst case scenario for us is ending up in a snow bank or getting a cold." On the lake, a short drive down a private road, Knorr-Bremse has access to a huge or-bital track measuring more than half a kilometer across. "Here's where we can test just how well the different electronic support systems interact and find out at which point physics beats technology," Dr Gerum explains. "There is a lot we can do to make a truck more stable and safe, but we can't change the laws of nature. Here is where we can test how far we can go with any given spec." 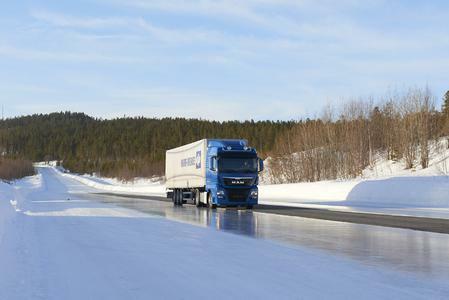 During a round or two on the ice, it becomes obvious what Dr Gerum is referring to: Every time the combination is about to start drifting off the intended line, the truck will autonomously reduce speed to ensure it doesn't start breaking out - regardless of how stubbornly you press the pedal to the metal. But the technology still can't prevent you from failing to counter steer, for example. "We can do a lot by integrating technologies like ABS, EBS, ASR, ESP and RSS, but we still can't tame nature," Dr Gerum says. "The exciting part is that it all began with the work we've done on truck and trailer ABS back when we first arrived. Now there is so much more to it, but that's where it all began. Now we are at a point where the electronic system can help you stay in control by making thousands of calculations every second, taking into account everything from μ-split to the vehicle's center of gravity," he adds. "Only here can you safely experience what a modern truck can actually do. It's amazing." 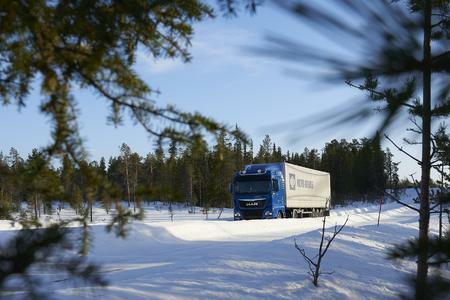 The foundation for the autonomous truck, Dr Gerum says, has likely been laid in the solitude of Lapland too. "It's here where much of the technology has been tested that will end up in self-driving trucks at some stage, no doubt about that," he says - indicating we're probably still a decade away from a real life application. 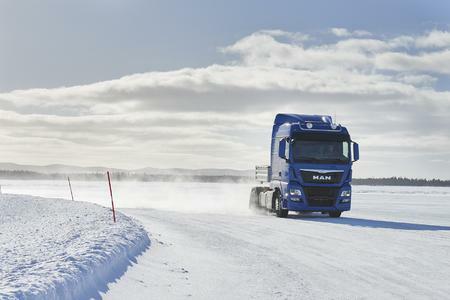 "What we do here in the snow every year is invaluable for commercial vehicle safety in general. It might not look like much when you get here, and it certainly is a very dark and cold place, but what our work here does for the people out on the road is worth every hardship."